Aquatint published by R. Cribb in 1808 and part of King George III's Topographical Collection. 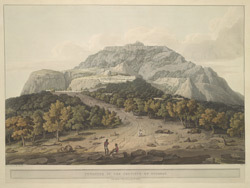 View of the hill fort at Pavagadh (Pawagarh), 50 km from Vadodara (Baroda) in Gujarat State in West India. The fort is dramatically located on a solitary rock overlooking a river, and the hilly passage from it leads to the town of Champaner below. The sacred hill of Pavagadh rises in three stages to 820 ms and is a popular pilgrimage site, with the Mahakalika temple dedicated to Shakti or the Mother Goddess on it and many Jain temples. The fort was originally a stronghold of the Chauhan Rajputs in the 13th century. It was conquered by Sultan Mahmud Begarha in the late 15th century. He then built Champaner which became the capital of the Gujarat Sultans until supplanted by Ahmedabad in the 1530s. The Mughals under Humayun captured the fort in the 16th century, and eventually it passed into British hands.